The school follows a combination of progressive Montessori and traditional curriculum, which is age appropriate and uses English as the medium of instruction. Early Childhood Care and Education (ECCE) are today acknowledged as a crucial input and as a foundation for lifelong development. In our country it is also essential to realise the goal of Universal Elementary Education. Research has shown that the first six years of life are critical and it is necessary to optimise development at this stage. A common basic curriculum for the young child must be developmentally appropriate and activity-based, with equitable quality for diverse environments. The goal and objective of Early Childhood Development (ECD) is the all-round, total integration and balanced development of the child, from birth up to school age. – Enhance the child’s health and physical well-being. – Involve parents and community. – Give special attention to children with special needs. The theme approach is based on the concept of integration, which means combining parts to make a whole. This approach to learning, also called “thematic” or “unit approach” focuses on a total learning experience, which engages the child. 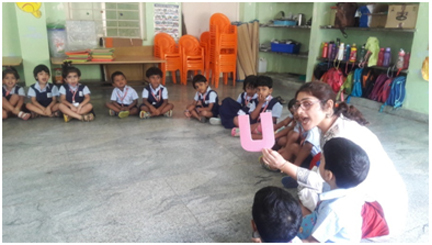 It thus incorporates and co-ordinates all areas of learning – reading and number readiness, writing readiness, social studies, science, creative activities, drama, music and movement, language activities, etc., in the form of activities related to the theme in focus. 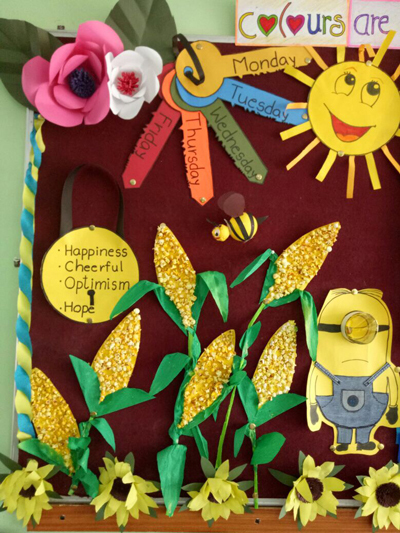 Planning and selecting themes for the whole year is according to the appropriate time and season which helps in pacing out the learning in segments throughout the year. A “WEB OF ACTIVITIES” can be followed to lay down the objectives, content, methodology and evaluation. 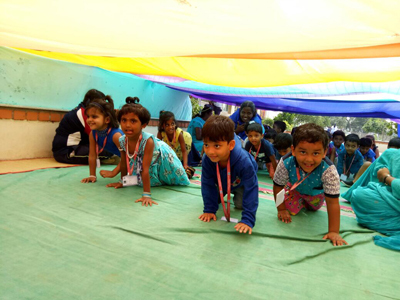 Themes are selected to widen the understanding of the child and are selected from the child’s immediate environment and based on the interests. – The child’s relationship with the physical environment. – The child’s relationship to self and people. – The child’s relationship with technology. – The child’s relationship to the current issues and events. 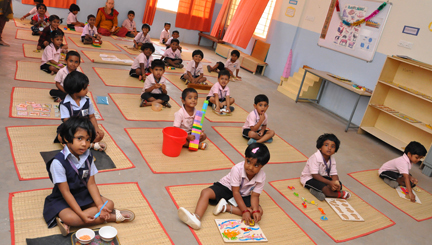 Pre KG, LKG and UKG – Learning involves many skills and knowledge areas. The skills and concepts involved in childhood learning can be organized into skill groups. The components are: Theme Time, Math Skill, Language Skill, Rhymes and Stories, Art and Craft, Creative Work, Montessori, Edusports, Play Time and Assessment. M1 and M2 – Montessori environment. Learning is a continuous process which takes place not only in the school environment but also in the child’s first 2 environments, the home and the neighborhood. Activities are Language, Sensorial, Arithmetic, Scientific and Practical Life Skills. Our kindergarten schedule is flexible and caters to the needs of the individual child and the group. 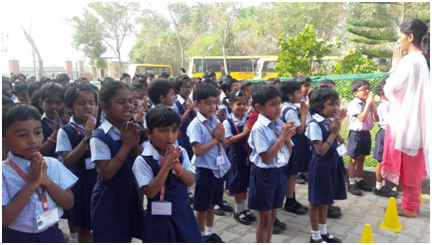 Each morning the class gathers for a morning assembly which consists of a prayer and recitation of slokas. 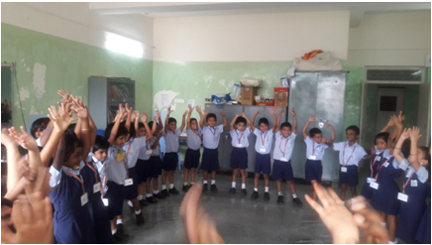 In the morning, each class gathers to participate in a variety of activities which are designed to develop skills in areas such as listening, speaking, social behaviour, celebration, music and math. 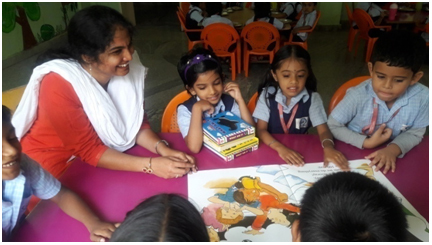 The stories are read aloud in order to strengthen listening and comprehension skills and to foster love towards books. Facilitators make the session very interesting using props, voice modulation and more such expressions. A variety of digital resources are available. 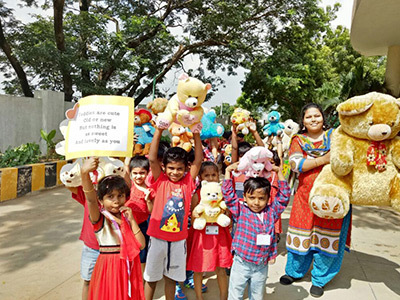 Children sing rhymes of different topics, on culture, manners, fruits, vegetables etc., which improves their vocabulary, voice modulation and sense of rhythm. Collection of story books / picture books are distributed to children to encourage and inculcate a habit of reading. 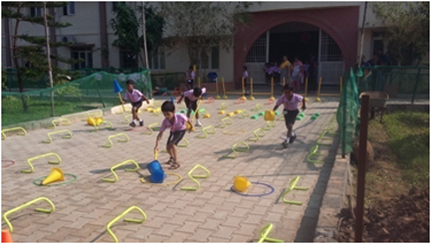 We aim at a well rounded academic, physical and social development programme to enhance the skills of each child. Different indoor and outdoor games will be organised for their overall development. – Each classroom is a prepared environment, designed to support the child’s need for purposeful activities. – Children choose their activities, perform, repeat and complete their activities. – They concentrate on their work and learn to work independently. – They correct their own mistakes by self-judgement. 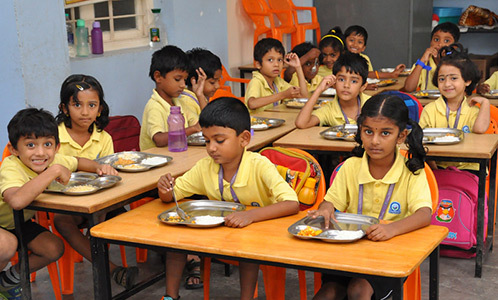 Children will be served healthy and nutritious mid-morning snacks and lunch, to make them energetic and participate actively in the class.